What I refuse to compromise on is the fresh coriander and garlic chutney. Quick, easy and a wonderful accompaniment to any Indian meal but an absolute requirement for chaat. 1. Peel and dice the potatoes and set aside. 2. Cook and drain the chickpeas . Add 2 teaspoons chaat masala, 2 teaspoons pomegranate powder and salt to taste. Mix well and set aside. 3. Prep the chutney by blending the coriander, garlic, green chilli, lemon juice and a little water in a mixer until you get a smooth consistency. Season with salt and red chilli powder to suit your tastes. Add more green chilli if you like it really spicy. 4. Chop up onions and set aside. 5. When you are ready to eat, start assembling! 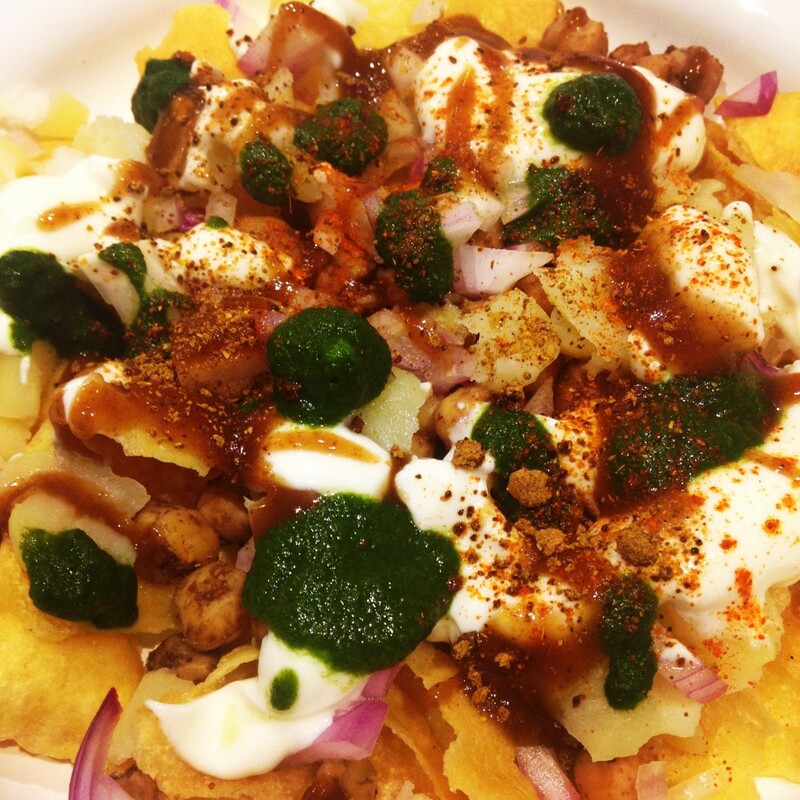 Start by breaking the papdi chips in half and spreading them on a plate. 6. Now, add the chickpeas and potatoes. 7. Drizzle the yogurt over the mix, followed by the coriander chutney and the tamarind sauce. 8. Sprinkle chopped onions for garnish. 9. And lastly, a sprinkle of chaat masala and red chilli powder before gobbling it all up!